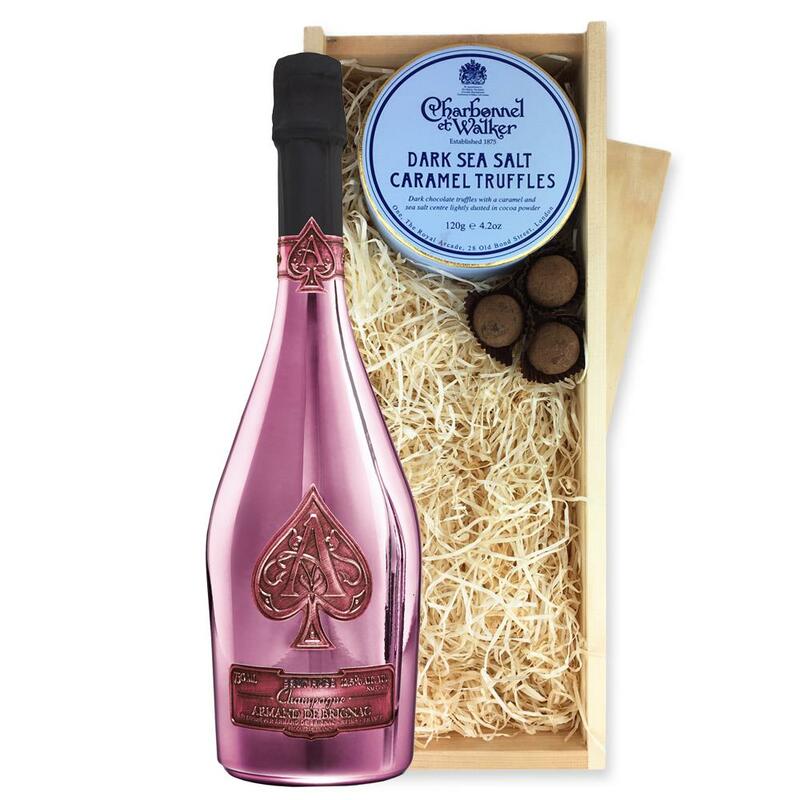 A single bottle of Armand de Brignac Brut Rose NV 75cl, Champagne & Charbonnel - Dark Sea Salt Chocolate Truffles (110g), Presented in a wooden gift box with sliding lid and lined with wood wool with a Gift Card for your personal message. Armand de Brignac Brut Rose NV Champagne 75cl in Branded Box Armand de Brignac Rose offers all the fruity freshness you would expect from a high-quality young pink bubbly. The different red berry notes are clean and inviting. All this is combined with an accentuated dash of green herbs and spices. A great alternative not only for that extra special aperitif moment but also for the dinner table. This Rose gives the term pretty in pink a new meaning. A Must Try! Armand de Brignac Rose - Rated the No.1 Champagne in the World Composition: 50 Pinot Noir, 40 Pinot Meunier and 10 Chardonnay. Created by the assemblage process, with 12 still Pinot Noir blended into a sparkling white cuvée. Residual Sugar: 9.65g/litre. Tasting Notes A beautiful salmon-hued wine with aromas of fresh strawberries and blackcurrant. The bouquet is rich, with red fruits up front and lightly smoky grilled notes behind. Armand de Brignac's characteristic long, silky finish. Ideal as an aperitif or served with fish, poultry, blue cheese or desserts.